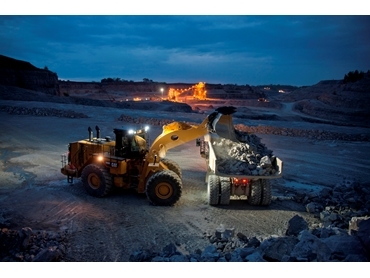 Caterpillar has released its latest wheel loader, the 990K. According to Cat this new wheel loader “offers more power and increased payload for greater productivity and fuel efficiency”. There are a number of new features on the machine, including a redesigned cab, better operator and maintenance technician safety features, and technology designed for better overall performance. The machine has been designed to operate with Cat’s 773, 775, and 777 trucks. Its payload is rated to 16 tonnes, a jump from the 15 tonne payload of the H Series model. “The increased payload makes the new loader a perfect 4-pass match with the Cat 775 truck for efficient, high-production loading,” Caterpillar said. The new ‘Performance Series’ buckets also allow for fast filling and full bucket loads on every pass, and are available in sizes ranging from 8.6 to 10 cubic metres. It has an operating weight of 80 tonnes and a static tipping load, full turn of 44 tonnes. Caterpillar’s 990K is powered by a Cat C27 ACERT engine, which delivers an 11 per cent increase in overall power compared to the 990H. It has a net power of 521kW for increased production, without any major change in fuel consumption. A lower engine speed also aids more economical fuel use. “Additional fuel savings accrue with the 990K ECO Mode (on-demand throttle), engine-idle shutdown system, and engine-idle kickdown/auto-resume system,” it said. Drive-wise, it features a field proven impeller clutch torque convertor that uses a lock-up clutch that provides direct drive to boost fuel economy, trim cycle times, and reduce heat, in particular for load-and-carry applications. Its positive flow control implement hydraulics use variable displacement, electronically controlled pumps to apportion oil and movement based on precise operator control. A redesigned cab now provides greater access and egress as well as increased noise suppression, cutting levels down to 69.9 dB. Its seat also has integrated, seat-mounted controls for smoother operation. The machine has a Cat Vital Information Management System (VIMS) 3G “which provides customizable operator profiles, a cycle timer and an integral Payload Control System, which provides on-the-go payload weighing. The graphical information display is easy to use and keeps key information in front of the operator”. It also equipped with a rearview camera system and in-cab display to show the operator the area behind the loader. A second panel provides convenient access to the battery disconnect switch and a jump-start receptacle. Routine maintenance points are easily accessed, including hydraulic pressure taps and oil sampling ports.